– Prypiat – all of the most important buildings: 3 hospital buildings, 2 kindergartens, 2 schools, 2 crèches, a pool, the house of culture, the cinema, a hotel, the music school, the stadium, the Jupiter plant, a police checkpoint, a storage yard of abandoned vehicles, a cafe, a greenhouse, several high-rises, and the amusement park. 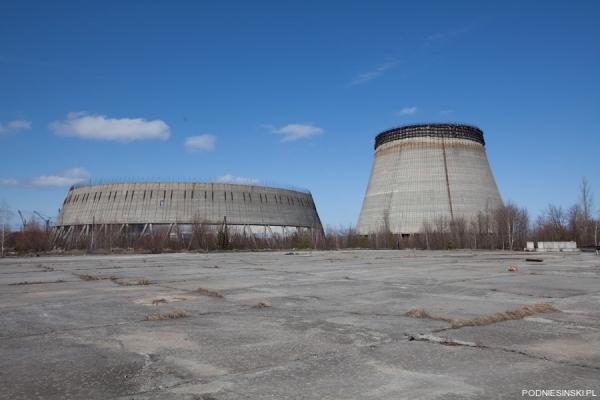 – The radiobiological laboratory and the nearby cooling tower. 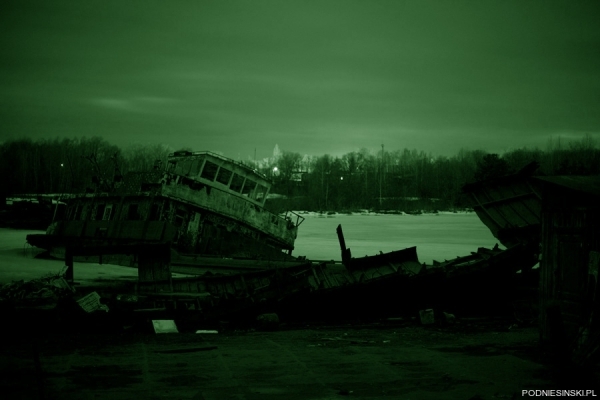 – Chernobyl – the nuclear power plant, river port, entrance to the barge, abandoned houses, this included night trips. 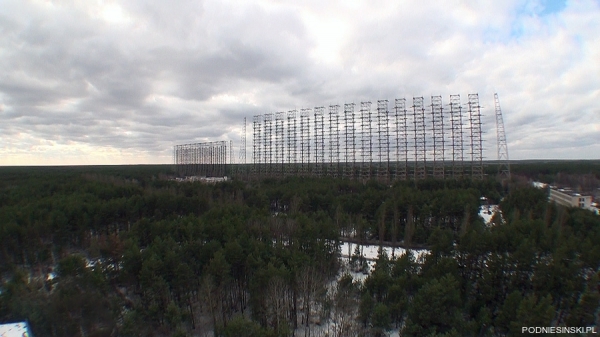 – Chernobyl 2 – DUGA radar, the area surrounding the buildings and an unsuccessful attempt to reach the auxiliary radar known as “Circle”. 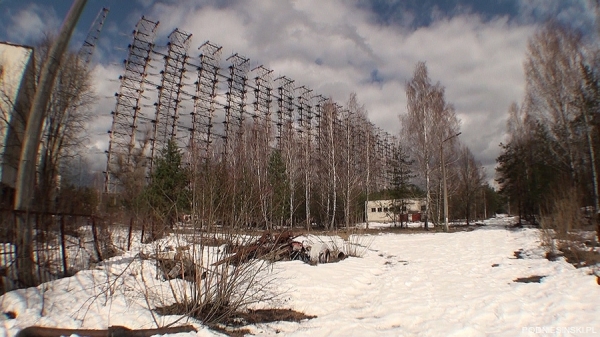 – An abandoned village near Chernobyl. 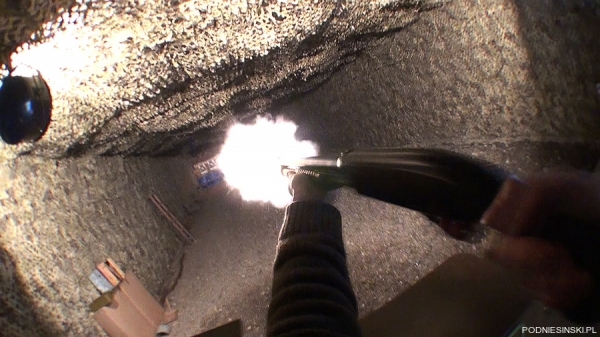 Generally what surprised us this time was the rapidly progressing deterioration and destruction of the zone. The changes which have come about since our last journey (half a year ago) are immense. Starting from the barges which are systematically cut into smaller pieces and scrapped legally, by companies working in the zone. What is interesting is that the barges are not brought to shore and cut up there. 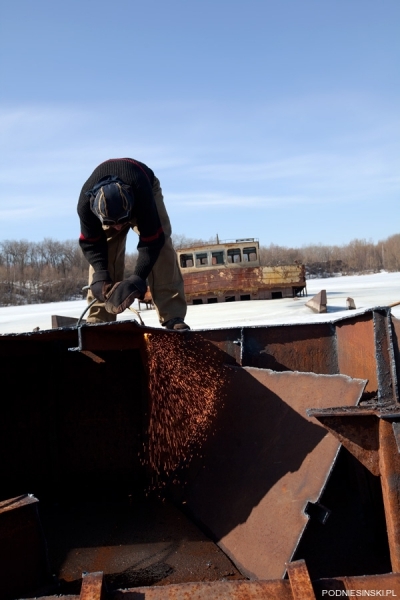 Taking advantage of the winter and thick layer of ice covering the whole bay, workers cut the barges directly where they are stuck lodged in the ice. Parts protruding from the ice are cut off from the rest of the ship and transported in small pieces by sleigh to the riverbank. Of course, the remaining pieces remain untouched and when the thaw comes, are completely under water. In this way at least 3 large barges, which we were fortunately able to photograph during our last visit, have disappeared already. 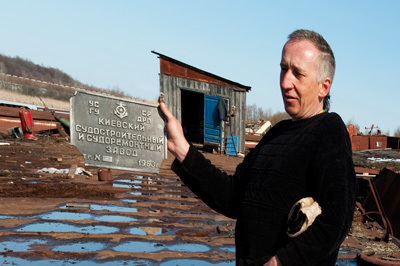 While we were looking at the barges, one of the workers offered us an identification plate from one of the barges with the name of the unit, date and name of the shipyard where it was built. Initially for very little money, but then even for free. As long as it could survive. Otherwise, the plate would be scrapped and melted down. Unfortunately, strict prohibitions against taking any item from the zone are relentless. It doesn’t matter that the plate would soon be destroyed. It doesn’t matter that, by taking it, we would save a piece of history. It is not allowed, end of discussion. Similarly, books, newspapers and other documents are disappearing. But not because they are being stolen. Leaking roofs and ubiquitous water, which every year is reaching lower floors of the buildings, are causing the remaining documents, which are witness to the tragedy that occurred here a quarter of a century ago, to be destroyed. It is all turning into one wet, grey pulp. In another year, two at most, the majority of the documents will disappear for good. From this perspective, the ban on removing items from the zone is surprising. If taken out, even illegally, they have a chance to survive. Remaining there, they will definitely disappear. I have always been opposed to taking any items from such places; after all, they are someone’s private property, part of someone’s history. But at least they can be a warning and testament to the tragedy for future generations or people visiting this place. Unfortunately in this case, I must change my opinion – left alone against the destructive power of nature, they will soon be irretrievably lost. Despite the fact that this trip was dedicated to the production of a film, we also took some black and white pictures. Below, there is a selection of pictures and film stills. Soon you will also see the new film. 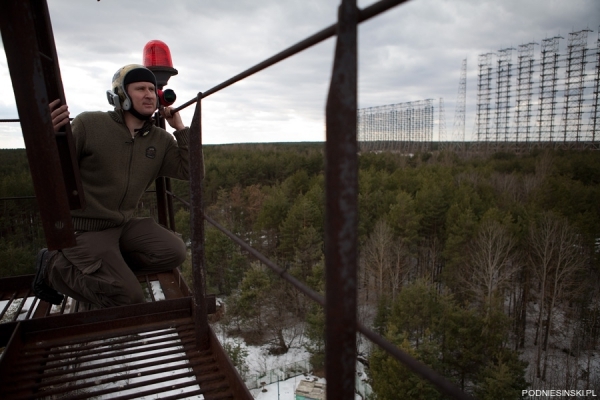 The first, being the only experimental depiction of the zone, has been seen over 100 000 times and the film itself has found itself on the hit list of many internet portals. I hope that the film which is currently in production will enjoy even greater interest. For those who still want more, I recommend the reports from my previous trips. 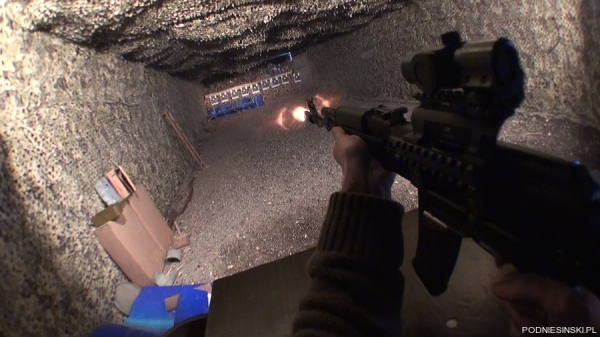 AK 101 with optical sight – Call of Duty, or Call of Prypiat, the adult version – that is, with real, live ammunition. 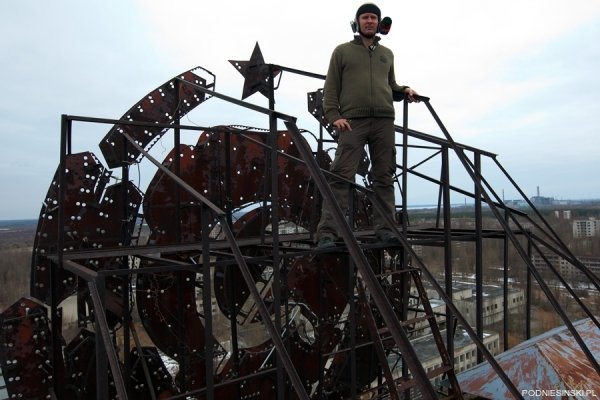 50 m above ground, eye to Eye :) Probably the best view of the Moscow Eye.